Georgia State (5-3, 4-1) traveled to Statesboro, Georgia and defeated Georgia Southern (0-8, 0-4) in comeback fashion 21-14. The win against ‘That Team Down South’ is the Panthers’ third consecutive win in the rivalry series and stretches their all-time record against them to 3-1. Wide receiver Penny Hart rode a second half explosion to finish with eight receptions, 191 yards and one touchdown after a quiet first half from the offense. On the game’s very first offensive play, cornerback Chandon Sullivan recovered a Myles Campbell fumble forced by James Traylor and returned it 28 yards for a touchdown. During the following possession, the Eagles nearly went three and out, but an extended 17-yard scramble from quarterback Shai Werts kept the drive alive. Surprisingly, Georgia Southern heavily used Werts’ arm on the possession, throwing five times for four completions. 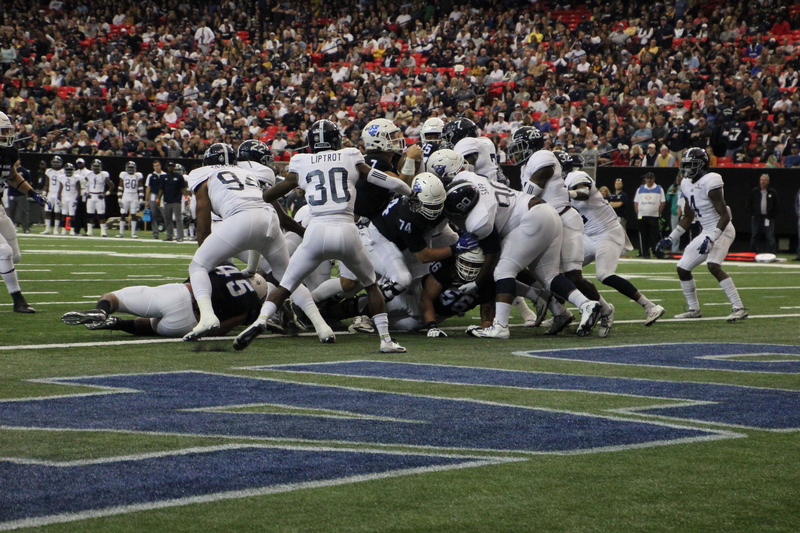 Four more third down conversions gave Georgia Southern a opportunity to score. Campbell took a short catch 12 yards for a touchdown with 6:40 remaining in the first quarter, tying the game at seven apiece. Georgia Southern drained seven minutes and 56 seconds off the clock. The Panthers and Eagles quickly turned an enticing beginning of the first half into a snoozer. Seven of the next 11 drives resulted in three and outs, and just four first downs were made. With just over a minute remaining in the half and with no momentum brewing, Georgia Southern received the spark they needed in Wesley Fields III’s 25-yard punt return, setting his team up shop at their own 49-yard line. Four short completions by Werts later, Tyler Bass drilled a 48-yard field down the middle, and Georgia Southern headed into halftime with a 10-7 lead. Head Coach Shawn Elliott dubbed the offense’s scoreless first half as “real vanilla” and said his team needed to take more shots. Elliott went straight to the source during halftime to nip the problem in the bud. “It would’ve been real easy for me to in there and chew on their [players] butts and do a lot of yelling and screaming, but I went in there and got on the coaches a little bit more than I got on those players. I called them up and I said ‘listen we’re playing 30 more minutes. Let’s do something we’ll remember for the rest of our lives’,” said Elliott. Though they didn’t score on the opening drive in the second half, the Panthers executed a well-designed double reverse, which was tossed back to Conner Manning, who hit a wide open Roger Carter for a gain of 17 yard. The gutsy play calling was a remnant, and Conner Manning hit Penny Hart for 17 yards on 4th & 11 inside of Georgia Southern territory. However, after a great first half of punting, Wright missed a 32-yard field goal attempt a few minutes later. Georgia Southern responded with a drive spanning over seven minutes. Werts’ five-yard touchdown scamper brought the score to 17-7 and was the Eagles’ last score. After a good start to the third quarter for Hart, he reeled in a 72-yard bomb on the first play of the next possession. Two plays later, Manning found Carter for a four-yard touchdown and his fourth reception of the game. Georgia Southern entered the fourth quarter with a 3-point lead but struggled mightily on offense. The result of their next four drives played out in the respective order; punt, punt, lost fumble and lost fumble. Georgia State did not have a hot a start to the final quarter as well. Their first three possessions resulted in two punts, and interception and a fumble. Desperately needing the ball, linebacker, Michael Shaw forced a timely fumble for the Panthers. James Traylor who forced a fumble early in the game recovered the ball with less than four minutes on the game clock. Next, Georgia State did what they needed to. Manning threw a pinpoint accurate ball to the back of the endzone, and Hart came down with it on a well-run corner route. As Manning’s toss to Hart which made the score 21-17 was in the air, Hart knew three things. “That adrenaline is rushing. That’s routine. We work on those plays, passes like that all the time,” said Hart. Georgia Southern made things interesting as they took the ball to the edge of the redzone. With no timeouts remaining, a scrambling Werts was tackled by Trey Payne on the 17-yard line and the game clock ran out. “The way that thing came down was exactly what that game should have came down– that defense having to make a great stop,” Elliott said. The Panthers can clinch bowl eligibility for just the second time in program history this Saturday, when they go on the road to face Texas State (2-7, 1-4). Texas State’s lone conference win came against FBS first-year squad, Coastal Carolina. The Bobcats own the conference’s worst pass offense and second-worst pass defense. Kickoff is at 3:00 p.m and can be viewed on ESPN3.